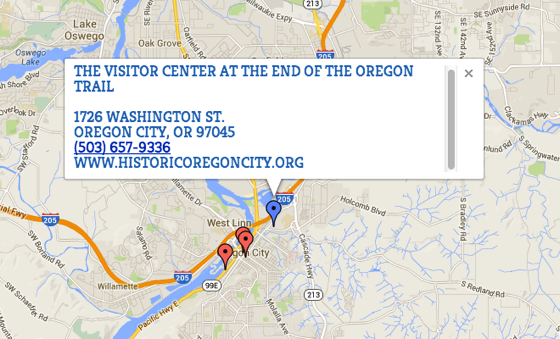 Video: A Presentation on “The Promise” – What to bring on the Oregon Trail? Comer Jefferson: Another thing about going on the trail is that when people were moving, from the South to the West, they would pack their belongings. They would sell their farms and pack their belongings and they would travel on the trail. So do you think you could bring your piano on the trial? Students: (Nooooo) Your sofa? Students: (Nooooo) Armchair? Yes? Students: (Nooooo) but people tried. So they packed them in their wagons. And as they traveled on the trail, and over mountains, through rivers, across streams, they had to throw them out along the way. So, you would see someone’s piano tossed on the road. You’d see someone’s sofa tossed on the road. They would break them up and burn them to start fires so they could stay warm. They had to keep their load as light as possible. Welch: Has anyone ever seen the Griffith Park museum, the Gene Autry Museum? Lovely! They had a whole room dedicated to things that were left along the trail. ANd they have letters from people who took the trail. it is really quite a lovely place to go. And imagine the things they thought they could bring. Because they had never travled that far. They didn’t know how bad it was. They didn’t know how bad it could get. Comer Jefferson: So one of the things about slaves going on the Oregon Trail and going to the new territories is that the Oregon Trail was sort of the great equalizer and everyone was sort of the same. It made everyone equal. A lot of people traveled in wagon trains and the wagon trains would have a driver and would be pulled by oxen, usually, not even horses. People on horses would ride beside. Oftentimes, everyone had to walk. Every child had to walk. Not just the black children — the salves — like what our family was used to, but all the children would have to walk. 2000 miles. Welch: So let’s start right now. Are you ready? (crowd) We can go right now? We’ll go from here. We’ll go to Missouri. We’ll be there in about, I don’t know, two years? Comer Jefferson: So the kids would have to walk. A lot of times the women would have to walk, but everyone was treated the same. Thanks for having us. My name is — like Arlene said — Dawn Comer Jefferson and I have a 5th grader here. 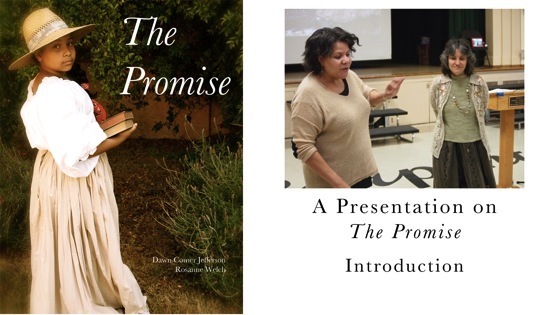 I am a writer/editor for television and also for books and I wrote this book, called The Promise, with my friend, Rosanne Welch, who is a college professor and also a television writer. 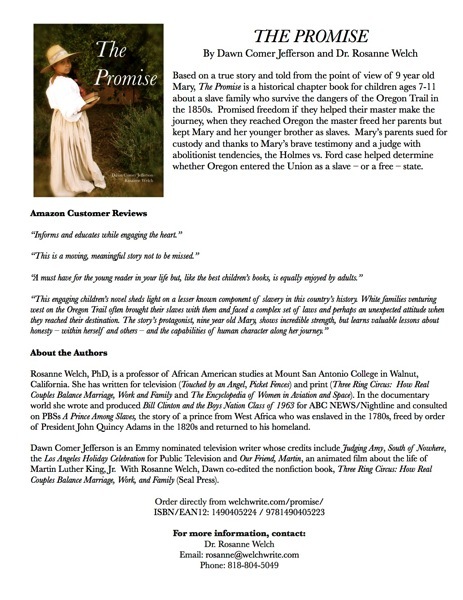 The Promise is based on a radio show that I did for National Public Radio and it is based on a true story. Now some of the kids in the last discussion had already read it. Have any of your read this? Ok, then I will tell you a little bit about it. 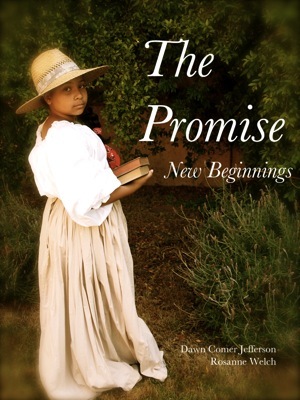 it’s based on a true story and it’s about a family in the 1850’s in Louisiana — a family of slaves — and it’s told from the point of view of the nine-year-old daughter in the family. And because the father can read and write, he was asked by his master to go on the Oregon Trail. It was a promise of freedom when they got to Oregon, but after traveling on the trail and having all sorts of hardships happen to them, when the master got to Oregon, he freed the parents, but kept the children. In 1854, the salve parents took the master to court and sued him for custody of their children and won. It’s a true story which basically influenced whether Oregon — which at the time was a territory, not a state — whether Oregon would come into the Union as a free state or a slave state. Because Oregon came in as a free state, so did Washington, so did California, and it really shaped the way we live today and the way the war went, as well. We thought the story was interesting because it all hinged on the story of this little girl. America is full of history and the Oregon Trail is one large part of that history. Over the next several weeks, we’ll be highlighting a site, park or visitor center dedicated to helping us learn more about the Oregon Trail. The National Oregon/California Trail Center is located within the beautiful Bear Lake Valley of Southeastern Idaho and situated on the historic site of the original Oregon Trail. The Trail Center was built to preserve, perpetuate and promote the pioneer history and heritage of the Oregon/California Trail and the Bear Lake Valley. The Center interprets the story of the pioneers who braved the arduous, six-month, 2,000 mile journey across the unsettled American West from Missouri to the Oregon Territory. The interpretation of this epoch migration is told using live actors within historically accurate interpretive areas located in the center. Vistitors join a simulated wagon train headed west and experience what it was like to prepare for the journey. Welch: What’s interesting about the legal method, we thought, again in Oregon at that time the territory was debating “Do we want to be a slave state or a free state?” We had a little rule for a while in the United States. Any time one territory wanted to enter, they had to have 2 territories — one would be slave and one would be free so that everything in the government was balanced. So no one could out vote each other. Right? So that was their deal. So you had to decide and there was an opportunity for the west coast — California itself could have been a slave state. IF you ever drive up near Bakersfield we grow cotton in California and cotton was a crop that required slave labor. So, this was a possibility and people had both sides if the argument. And luckily, in the case that Mary’s family went through, the judge happened to be an abolitionist. And we had those people from the very beginning. Comer Jefferson: Did everyone hear her? An abolitionist is someone who wants to abolish or destroy slavery. Welch: Exactly. Right. And we had people like the Adams Family — not the one’s who go click click — John Adams and his family were abolitionists in their own right in New England and they actually had a place for the Underground Railroad — which is whole ‘nother book we have to write, but — So, people from the very beginning of the country were against it, but they needed enough people on their side to overturn the idea. So, in our case, in this story, the judge had abolitionist sentiments — which is hose they would have phrased it back in the day. And so he could have judged either way on this case, but he chose to judge for the slave family to point out that that was the side he was one and the side Oregon should be on. 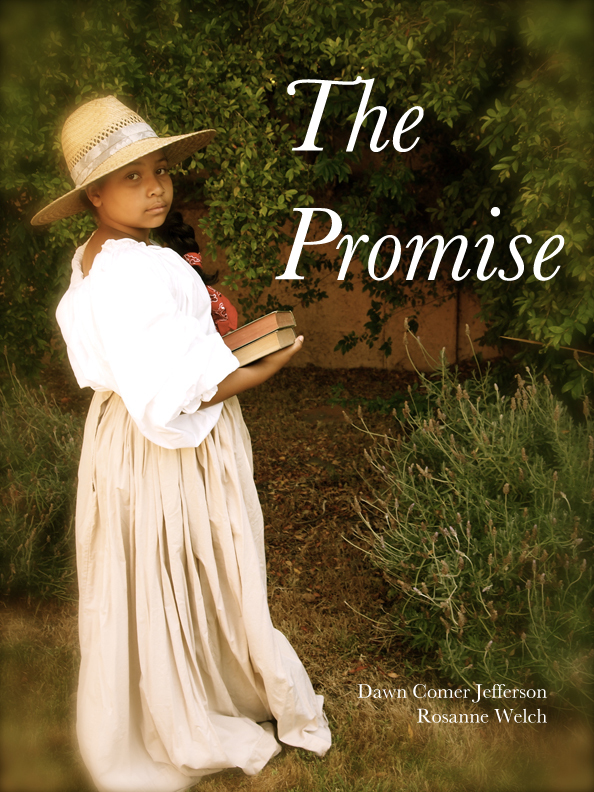 Comer Jefferson: …and he did it based on the testimony of Mary, the 9-year-old girl who is the heroine of the book, because we really wanted to have a little girl who was a strong heroine in a story and we thought that Mary’s story was the one to tell. “Names Hill is a bluff located on the bank of the Green River in the U.S. state of Wyoming, where travelers on the Oregon and California trails carved their names into the rock. It one of three notable “recording areas” along the emigrant trails in Wyoming along with Register Cliff and Independence Rock. Names Hill was located near a heavily used crossing of the Green River. The earliest human recordings at the site are Native American pictographs. European American names began appearing as early as 1822 as mountain men crossed the river on their way to the beaver streams of the Western Rocky Mountains. In 1844,Caleb Greenwood and Isaac Hitchcock lead the first wagon train over what would later be called the Sublette-Greenwood Cutoff, along the way crossing the Green River at Names Hill. The wagon trails would rest at the Green River following a 40 miles (64 km) waterless trek across the prairie, providing an opportunity for travelers to add their names to the hill. 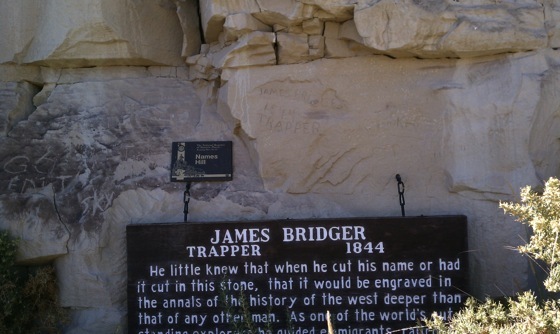 Among the more famous names inscribed on the rock is famed mountain man Jim Bridger. Some have disputed the authenticity of the signature as Bridger was thought have been illiterate. The End of the Oregon Trail Interpretive Center reopened in July 2013 with a “Bound for Oregon” featured film, interactive learning programs, exciting exhibits with a focus on free play and “please touch” spaces, group programs and 24/7 outdoor signage implementing smart phone technology. 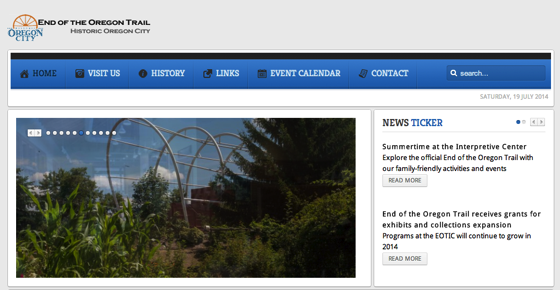 Plan your group or school tour today with our online form. Comer Jefferson: We want to deal with American Expansionism. Doesn’t anyone know what that means? Yeah! Welch: Exactly. The concept of “from sea to shining sea.” Right? There’s also the concept of Manifest Destiny, which meant that we had a right to own all the land from one end to the other side. Comer Jefferson: Thought we had a right to it. Welch: That’s what it means, yes. Exactly. So, this is what started the idea of the Oregon Trail. Right? Somebody like Jefferson felt that we had have land and every person should own there own plot of land and grow their own food on and this is going to make them a good citizen because they cared for the place because they owned it. Right? So, as we ran out of land on the East Coast, because more people got married and had children and pretty soon it was very busy. They kept moving west. And West. And West. That’s why we’re all here in California. How did you think we ended up in California? This wasn’t originally part of the Founding Fathers land, so the Oregon Trial helped move Americans west and that’s what the Holmes family we wrote about imagined. You lived in beautiful place. Yet, he wanted more so he figured “I’ll try going over there and get even more land.” But sadly, along the way. he lost most of what he had.